A sketch of a cicada in a van Gogh letter from July 1888. Next month will come Ever Yours: The Essential Letters of Vincent van Gogh, which runs to nearly eight hundred pages and is frequently more absorbing, expansive, and instructive than a collection of letters ought to be. (He seldom seems to miss the forest for the trees, you could say.) As I thumbed through it, a passage leaped out at me from exactly 130 years ago—a letter van Gogh wrote to his younger brother, Theo, on October 2, 1884. It’s both Grade A existential grousing—were it not for the (faintly) uplifting conclusion, I could’ve believed that Thomas Bernhard wrote it—and, it seems to me, pretty sound advice. Just slap something on it when you see a blank canvas staring at you with a sort of imbecility. But however meaningless and vain, however dead life appears, the man of faith, of energy, of warmth, and who knows something, doesn’t let himself be fobbed off like that. He steps in and does something, and hangs on to that, in short, breaks, ‘violates’—they say. 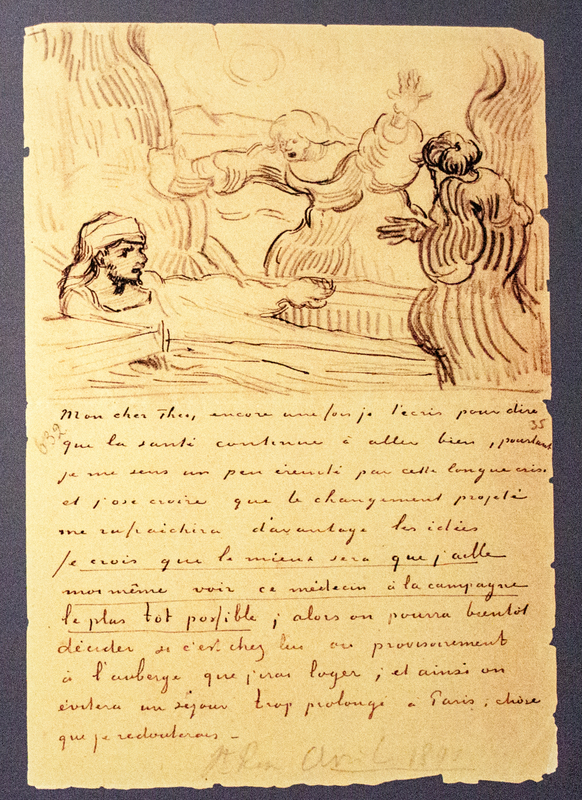 A letter of van Gogh’s from May 2, 1890.